General Construction (Est. $11,000) Major Appliances (Est. $7,000) Finishing (Est. $3,000) Wherever it's needed most! 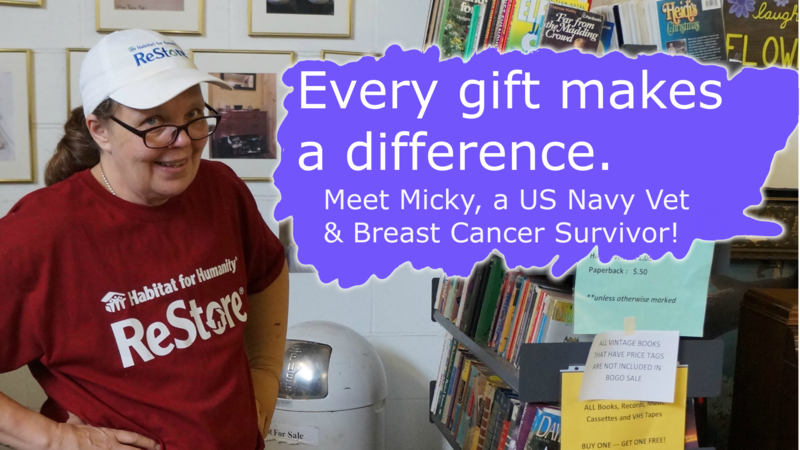 After graduating from high school in Warren, Ohio, Micky served in the United States Navy from September 1982 until January 1989, when she was honorably discharged as a Machinery Repairman 2nd class. She was a Correctional Officer at the Southeastern Correctional Facility from June 1992 – March 2004. Due to three back surgeries for a herniated disc, Micky retired in 2004. In December 2011, Micky was diagnosed with Stage 3 breast cancer. After a double mastectomy, chemotherapy and radiation, she has been CANCER FREE since 2012! While Micky is extremely grateful to be cancer free, she developed lymphedema in her left arm in June 2012. This condition leaves her susceptible to cellulitis, which has hospitalized her five times in the last few years. For the past 4 years, Micky has lived above a bar with no fire escape, and a single entrance and exit into the apartment. With the loud, constant noise from the bar, it is hard for Micky to sleep – especially on Friday nights. There is no elevator, and climbing the three flights of outdoor stairs makes it very difficult to complete daily duties. Micky has three grandchildren; Duncan 2 years old, Aubrey 6 years old, and Peyton 6 years old. Her current living conditions limits her ability to care for them at her apartment. It is virtually impossible for her to carry anything up the stairs because they are steep and makes it hard to feel safe.